Emerging T.O. : Links that Stink: Does Toronto Need More Diesel Trains? Links that Stink: Does Toronto Need More Diesel Trains? I want Toronto to be a better place. I know that sounds all warm and fuzzy. I mean, who actually wants Toronto to be a worse place than it is? But some times, when I see things happening around me that effect me, my clients, and our properties, I scratch my head and wonder: Who thinks this is a good idea? 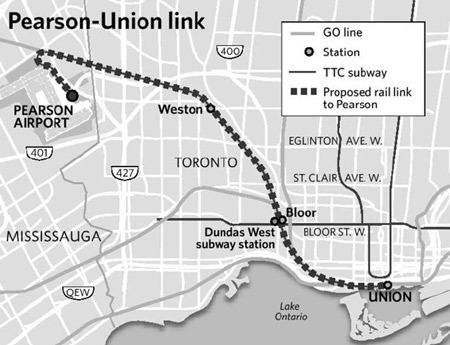 Take, for example, the proposed Air Rail Link that will run from Union Station to Person. Initially, this air rail link, brought to us by a provincial organization called Metrolinx, was supposed to be done for the Pan Am Games in 2015. It was part of the Toronto proposal for the Games, and we promised to get it done by then. Or at least Dalton McGuinty did when he was around. Now, I'm all for an air rail link to the airport. I don't know whether it's an economically sound idea. I heard from several sources that it may cost between $15 to $35 for a one way ticket to the airport. Ouch. But still, in theory, an air rail link seems like a good idea for a city of Toronto's size. Imagine being able to get to the airport in some thing other than a cab or a car! This could be great, if done right. During the planning for the Games, however, Metrolinx decided to go with diesel trains for this link to Pearson. Right now, they have about 50 diesel trains on the line each day, but once the Air Rail link is finished, we will have up to 450 diesel trains using this route each day. And here's what we know about diesel trains. The pollution from them causes cancer. They are noisier. They may require Metrolinx to build sound walls at certain locations along the corridor. As you may have heard, there have been residence uprisings in many neighbourhoods near the tracks. Understandably, they would prefer electric trains that don't create pollution and are quieter. Not very surprising really. Since the pollution can carry up to 2 kms, some people a fair distance from this area are also involved. So, if you are like me, you may thinking: Why not just do electric? It must have to do some thing with cost.... Well, you are right at first glance. To build the infrastructure and to purchase the electric trains, it is more expensive. But they are are cheaper to run and cheaper to maintain. You just need more money off the top, then you spend less. And here's the really odd thing: Metrolinx have actually built the infrastructure for electric lines for the future. So, it seems that the plan is to build a diesel train system possibly with sound walls only to be potentially replaced by electric ones in the future where sound walls won't be required. So, we may pay for it twice. And why? To meet a deadline for a 3 week sporting event? I feel it's great that Toronto is having the Pan Am Games. I love sports. I'm even a little excited for the Pan Am Games, but I also have to live in the city when it's done. The funny thing is, Canada is the only Western nation without any electric trains in them. The U.S. has them in the Northwest and soon in California. All of Europe is covered in them from Spain the the UK to Russia and the Ukraine. Japan has them. Australia too. Even developing nations like India and Malaysia have them. The good news: There seems to be a slight change in the air around this issue. We have a new leader in the provincial government. This government did not make the same commitments as the last one, and hopefully they can see how this diesel train idea is a bad one. Some politicians have hinted that there may be some reconsideration going on. The light has been turned back on at the end of the tunnel. So fingers crossed that reason will reign here and electric will be done right from the get-go, and we can skip this diesel stuff all together. Hamilton: Toronto's Next Emerging Neighbourhood? South Etobicoke: Suburban No More? Is Flipping a Renovated Dump Still the Way to Go? A 16% Decrease in Home Sales. Should You Worry?